Ever since my parents brought home a bread maker from the US last year, I have been experimenting with different types of breads. Bread makers really make your job easy. All you need to do is put the ingredients of the recipe in the right quantity and in the right order into the bread maker and the rest of the job is taken care of for you. The important thing as the manual keeps stressing again and again is to use exact quantities of the ingredients specified in the recipe and to put them in the right order. To help with the quantities, my parents also brought home a set of measures that helps me measure out exact quantities - 1 and 3/4 cup, 1 and 1/8 cup for example - all such measures can be done exactly! There is one problem with the bread maker however. There is a small mixer that is to be fixed at the base. This causes an uneven hole to form at the bottom of the bread. I can live with that however. I guess they cannot avoid that! 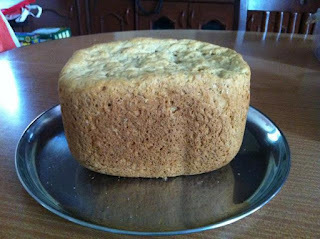 I have tried different types of bread - regular white, whole wheat, cinnamon and raisin, honey grain, Italian Herb etc.. Most of them turned out very well. The 100% whole wheat was an exception. It wouldn't rise well enough and wouldn't be fluffy. I tried many changes to the recipe. More water, more yeast, a touch of oil. Though most variations were better than the original recipe, none was frankly, good enough. When I look at the whole wheat breads available in the market and take a closer look at the ingredients, I find that most of them are not 100% whole wheat! They all list wheat flour (maida) as one of the ingredients. Now I know why! Italian Herb Bread - this one contains Parmesan Cheese, Parsley and Basil. Tastes really good with all those herbs. You get a mix of the flavors from the main ingredients. The bread usually caves in at the top - I have no clue on how to avoid this! No problem in rising however and it is as soft and fluffy as it should be. Honey Grain Bread - contains a mix of maida, whole wheat flour, oats and honey. I sometimes use this as the base for other recipes. It is healthier than the regular maida bread. I have used it successfully with Italian Herbs as well. The bread itself is neutral to taste. But the addition of whole wheat and oats makes it an excellent alternative to regular bread. Cinnamon and raisin bread - is a complete refined flour bread with a dash of cinnamon powder and black raisins. 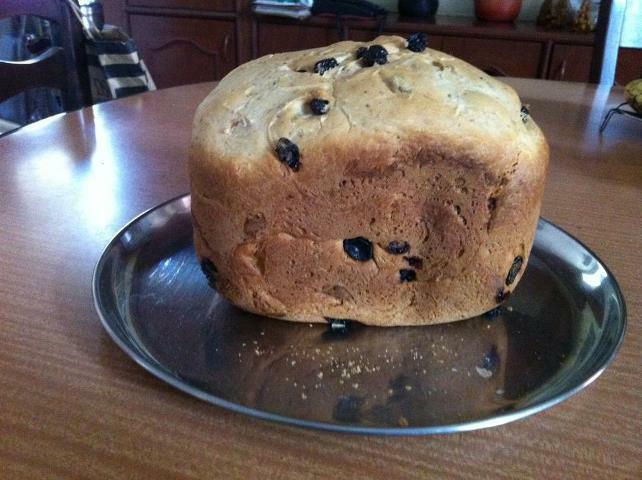 This one is slightly sweet due to the raisins - not cloying by any means. This one rose so well that it was a treat to look at and eat as well! I read somewhere that a tip for making wholewheat bread lighter is to add Vit C to it! About 250mg for a standard loaf. Try it and let me know how you get on. Vitamin C - available in what form? Is it just available off the shelf? Just get any Vit C tablet, measure out approx 259 mg and crush it into powder.